Cambodia annually celebrates Queen Mother's Birthday on June 18. This national holiday celebrates the birthday of Queen Mother Norodom Monineath. Norodom Monineath (born as Paule-Monique Izzi) was born on June 18, 1936 in Saigon, French Indochina (present day Vietnam). Her father Jean-François Izzi was a French banker and her mother Pomme Peang was born in Phnom Penh, the capital of Cambodia. Monineath had a good education and towards the 1960s she became the President of Cambodian Red Cross. King of Cambodia Norodom Sihanouk married her in 1952. She gave birth to two sons: Norodom Sihamoni in 1953 and Norodom Narindrapong in 1954. Her oldest son is an acting King of Cambodia. 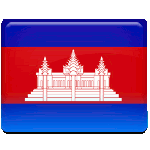 The Cambodians love Norodom Monineath very much. Her birthday is an official day-off. On this day people pray for health of their Queen Mother and visit Buddhist temples. There are no parades or public events on this day, but traditional arts performances and a great display of firework are organized in Phnom Penh.